Neck: I select every piece of wood myself. Why a laminate neck you ask? All wood moves to some degree with changes in humidity and temperature. 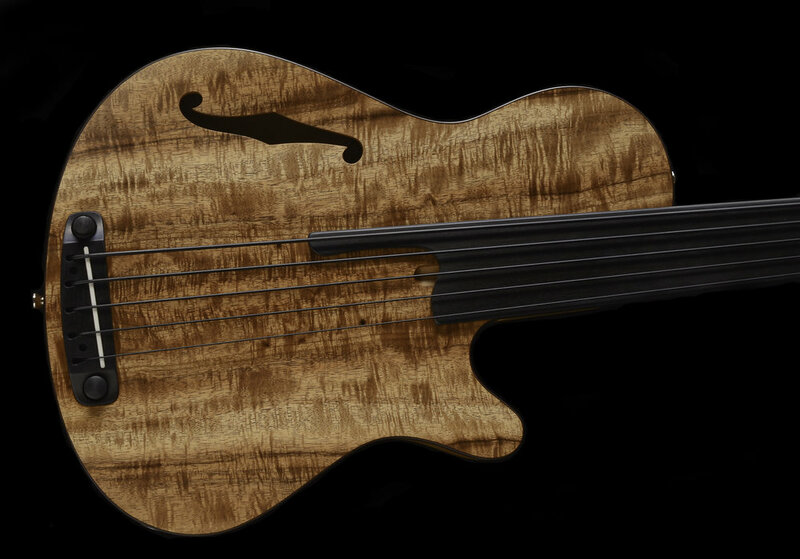 By combining 3 pieces of quartersawn black walnut and two ebony strips, you have 5 pieces of wood that when properly oriented will all move in slightly different directions from one another, in effect canceling each other out, creating a more stable and rigid neck. Since the body of the Deep 4/5 is extra hollow, the most rigid neck is needed to produce a strong fundamental tone and no dead spots. The fingerboard is ebony, and is made from the same stock as the bridge, for a perfect match. All the wood is dried to 6% humidity or below, and a non-water based glue is used during construction, as to not destabilize the wood. 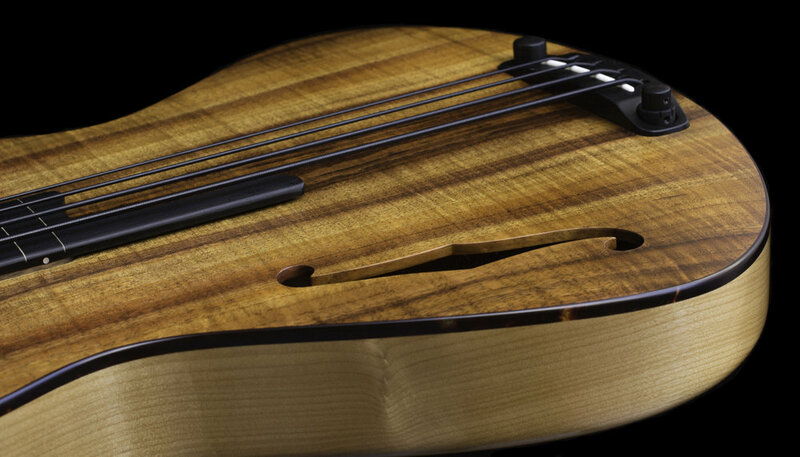 Electronics: The Deep 4/5 basses feature electronics designed an manufactured specifically for these models. Controls are a master volume and stacked treble/bass, both integrated into the ebony bridge. The piezo pickup is a vibration sensor, therefore it "hears" the whole instrument, which is what makes the materials and design so important. 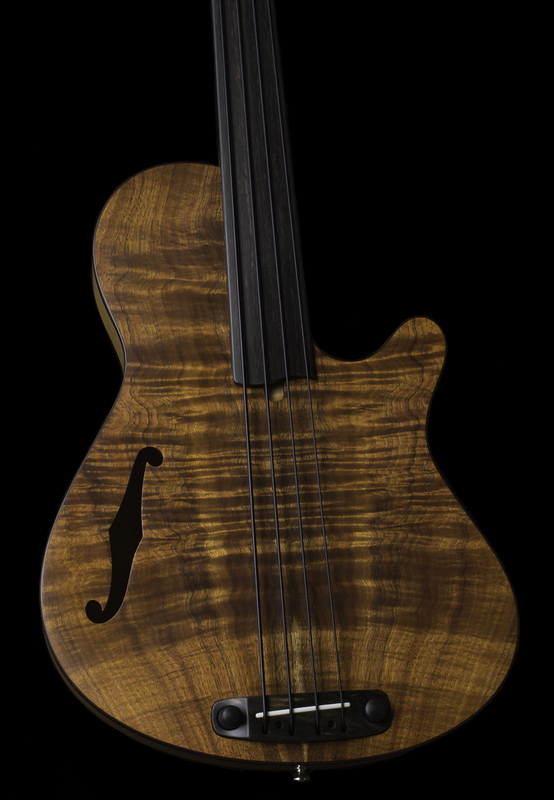 I’m a purist when it comes to tone and believe an instrument should do one thing really well, as opposed to doing a few things pretty good, and that is my aim with this bass; to give the best, fullest bass tone possible.